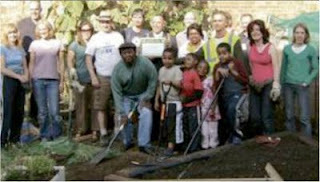 Stand Up For Stockwell: Green fingered group rescue barren land and get national award! Green fingered group rescue barren land and get national award! Four gardens that had been untouched for the past 20 years have been transformed from an overgrown mess into a public garden the whole of the South Lambeth estate can enjoy. The Bolney Meadow Group has now been handed an award from the Britain in Bloom organisers. The gardening group worked with the council’s Community Freshview team to clear the land and create the space to make the garden a reality. The gardeners have been recognised with a Royal Horticultural Society Britain in Bloom Neighbourhood award. As part of the Community Freshview programme Lambeth council’s waste team from Veolia provided assistance, along with offenders from the community payback scheme. Councillor Sally Prentice, Lambeth’s cabinet member for environment, said: “This is such a fantastic example of what can be achieved when residents and the council work together, and together they have made a huge difference to the area. Credit must go to the residents who have pulled together and put in so much hard work.